A classic winery wedding styled with fresh crisp florals, complete with sweet tunes and page Prosecco bonbonniere; Ally + Dean curated a beautiful selection of elements that married perfectly on the day. Tobi Tobi set the vibe by filling the intimate chapel with sweet tunes. Wootton and Nicholls put together the most beautiful combinations of crisp white and pale pink roses alongside white orchids and fresh greenery, we adored the way the floral instillation on a simple backdrop created a frame around Ally + Dean throughout the ceremony. Ally looked incredible in a modern dress by One Day Bridal, the personalised back side panels gave some intricacy to the simplistic geometric lines of the gowns silhouette. These two were just the sweetest and really made the most of their moments together, including their finale dance under the festive lights! The fun loving Karen + Gary travelled all the way from Hong Kong to the Yarra Valley to have their destination wedding at the very beautiful Stones Of The Yarra Valley. Combining a modern ceremony with an outdoor Chinese tea ceremony, their day was simple and elegant. Beautiful pastel pink and white roses decorated the tables + chandeliers draped from the ceiling of the barn. Like This band got the party started with a Conga line & the couple danced their way out under a line of sparklers. Check out our latest shoot with this gorgeous little fam, enjoying an evening in the Yarra Valley with their two cherubs. We adored letting these guys be themselves in front of our lens, it was just the sweetest thing for us to capture. Even though iphones document our everyday lives, there will always be something so special about beautiful quality family portraits that highlight close relationships and honest personalities. Thank you for allowing us into your beautiful lives Fi, Chris, Finn + Stella! Van + Will held a traditional tea ceremony surrounded by family, followed by a Christian church ceremony at one of the most beautiful church’ in Melbourne - St Brendans church Flemington. The pastel blue walls and large arched windows reflect a beautiful soft light throughout and create an elegant fresh take on a normally moody and dark ceremony option. The couple chose Melbourne CBD to take some portraits in a modern setting with architectural lines being the focus. The sharp angles and structural lines juxtaposed to the curved & flow of Vans incredible couture wedding gown by Jason Grech. We are absolutely obsessed with Vans stunning wedding dress, the full skirt and oversized bow was an absolute treat to photograph! Congratulations again to the gorgeous Van + Will. Cass + Louis have us completely Lost In Love with their youthful love and beautiful energy. Inspired by a New York rooftop, Styled By Coco did the most incredible job transforming the already beautiful space at Circa - The Deck. Geometric shapes, semi circle black velvet lounges and gold tables decorated with pops of pink & red florals. In theme cocktails such as Cosmopolitans, Manhattans and Espresso Martini’s were served at the pale blue bar. Cass + Louis both looked incredible. Cass’ Balmain-esque gown was designed and created by the talented J’Aton. 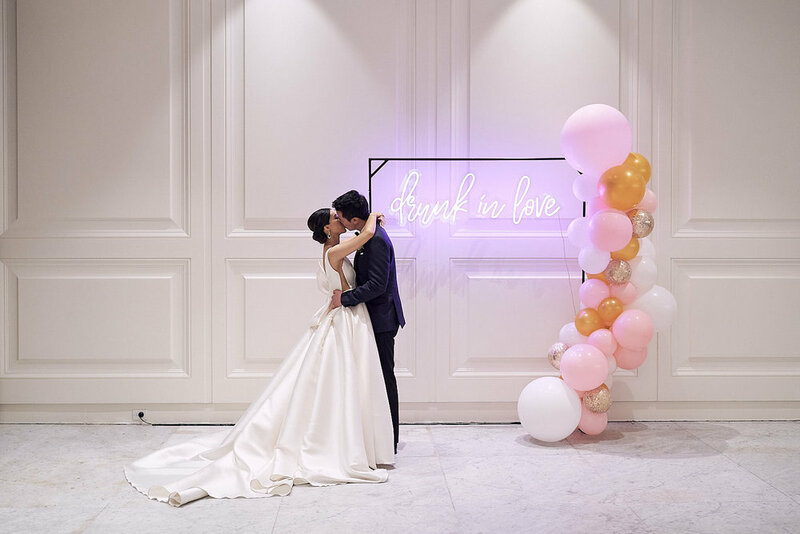 Filmed by our faves - Moon & Back Co.
Robbie + Amila’s intimate Amalfi Coast wedding had all the right elements to make for the most memorable day of their lives. After a beautiful heartfelt first see, Amila & Robbie exchanged vows within the beautiful white washed walls of the Cloister at the Grand Hotel Convento Amalfi. Emotions were high as tears ran down cheeks. The ceremony was followed by Vanity Fair Inspired portraits with friends and family whilst sipping on crisp Prosecco. Jumping into a 80’s Alfa Romeo spider, the couple cruised around the stunning coastline and up the mountain to their wedding reception at Belmond Hotel Ravello. Starting with canapes overlooking the stunning azure ocean, Tobi Music set the mood with chilled out tunes. An intimate candle lit dinner under the olive tress was the perfect setting to watch the sun dip over the mountains. Stealing kisses in the clouds, Amila + Robbie slipped away for a few sunset photographs with the most gorgeous pastel sunset backdrop which reflected the pale blue mountains on the Belmond Pool. Their guests joined the couple on the rooftop pool to dance the night away! Its always a good idea to employ a wedding stylist to make your day extra beautiful with a theme that runs thoughtfully and consistently through all elements. We adore this ‘Drunk in love’ theme styling by the uber talented Nadalie at Harper & Co. The pink, gold and black colour palette, beautifully complement the modern space of The Deck at Prince Hotel. The tables were adorned with bunches of pink roses, pastel blue/grey orchids and deep maroon foliage, along side gold cutlery, white & grey linen and contrasted black candles. Festively welcoming the guests were big pastel pink oversized floating balloons. Beautiful styling by Weddings of Desire. Georgia and Josh achieved a modern yet timeless setting at the very beautiful Rocabella Santorini. Structured florals of soft pinks, whites and pastels surrounded by hundreds of candles complimented the incredible view of the sunset. The pool deck at Rocabella would have to have one of the best views in Santorini, setting the most perfect scene for a sunset dinner followed by dancing under the stars. Making the absolute most of their photo time, these two spent 30 minutes in the afternoon doing formal photos with family, friends and bridal party and then another 30 minutes right on sunset, which made for the most stunning sunset light as well as a bit of moody romantic dusk shots. Pallas Couture created Georgia’s dream gown which showed off her curves with a simple silhouette, plunging neckline and fluted train that moulded into the most perfect shape. The beaded detail on the dress glistened against the rugged scenery. 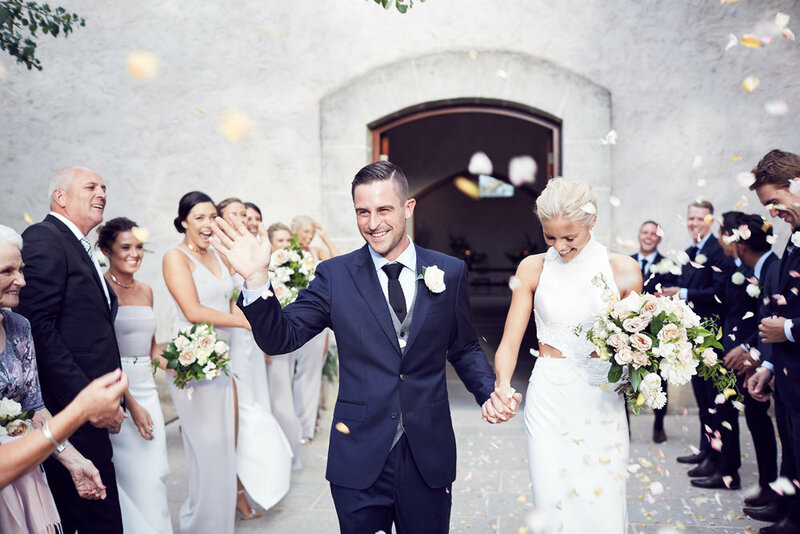 We adored the results of Fluers and Story Time Weddings teaming up for Alex + Kane’s wedding at Levantine Hill. A beautiful combination of delicate roses, hydrangeas and orchids paired with rustic magnolia leaves, subtly complimenting the woods & metallic accents of Levantine Hill. Welcome to Marlo + Hugh’s perfectly heartfelt wedding day, filled to the brim with tears of joy, laughter, champagne towers and epic dance moves. Held at one of the most grand wedding venues in Melbourne, Campbell Point house, Marlo + Hugh treated their guests to a sumptuous affair set amongst the manicured gardens. We adored photographing these two and their beautiful, raw moments. From sentimental bridesmaids, to Marlo’s proud as ever dad walking her down the aisle, Hugh wiping the tears from Marlo’s cheek mid ceremony, all the way to Hugh hitting the D-floor with his very own mother of the groom dance! A vivacious family that will forever hold a special place in our hearts. Art Direction + First Dance Choreographer The Next Step Co.